Woodland owners are invited to see a fine example of careful, long-term forest management at a field day on Saturday, October 20th in Lower Greenville (Cumberland County), NS. The 150-hectare woodlot is currently owned by Justin Rushton, who represents the third generation of Rushtons to work the land. Justin has been a member of North Nova Forest Owners Co-op for many years, where he has served on the Board of Directors and held the position of chairman. His family has been very active on their woodlot, and there are many different forest practices to see, from recent to 20-year-old plantations and areas of selection management. The woodlot is also used for many recreational activities, including walking, hunting and ATV use. In addition, Justin also has cultivated wild blueberries, operates a firewood processor, and has a small excavator which is used for both harvesting and earth work. The number of forest owners who still work their own land is declining, and this is a great place to see how one family approaches the challenge of woodland ownership. The Rushton Woodlot is at 5608 Wentworth Collingwood Road in Lower Greenville, which is about 5 kms from the old Wentworth school on Highway 4 in Wentworth. To see a map, click here. 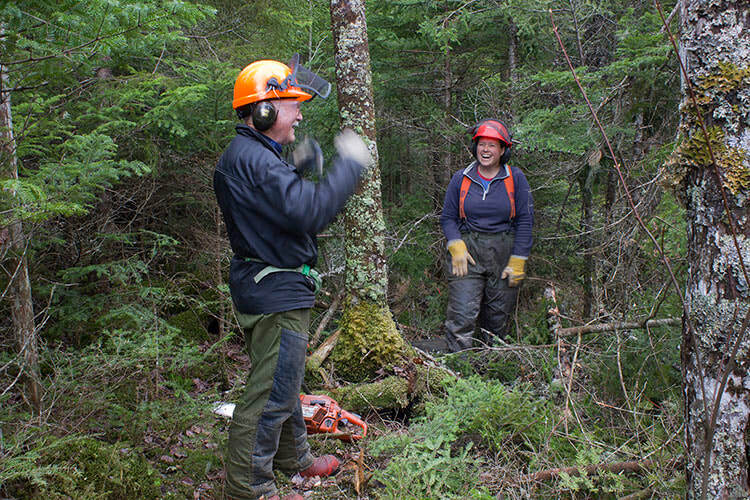 What happens on the woodlot next door is almost as important as how you manage your own land. Encourage your neighbours, friends and family members to come with you. The price is just $10 per person or $20 per family, which includes a light lunch. To attend, you must register by Wednesday, 17 October.